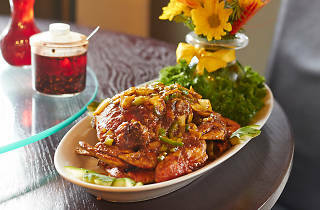 The Chinatown restaurant fuses multiple Chinese cuisines together to yield dishes like the chili crab, huge Dungeness crabs cooked with curry, onions, ketchup and other ingredients for a spicy, messy, delicious meal. 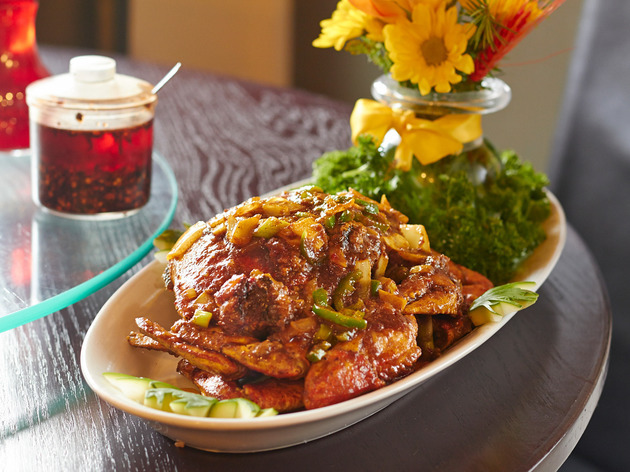 There's the usual suspects, like ma po tofu, but you're definitely rewarded when you try something new. El stop: Red to Cermak/Chinatown. Bus: 24, 21. I never get around to Chinatown enough, but I had a chance to go for the afternoon this past Friday and decided to check out this Michelin-award winning spot on W 23rd St. I was very pleased with my entire dining experience. The restaurant was extremely simple and lacking decor, but it was clean and bright. I had read in advance to try the French-style beef, so I decided to order that even though I have no idea really what "French-style" entails. I also ordered the Hong Kong iced milk tea and the spicy Korean beef build-your-own bao tacos--because who doesn't love tacos and bao? Everything was super delicious!! The highlight ended up being the signature French-style beef, seasoned with salt, pepper and other crave-worthy unknown spices and perfectly cooked to reveal a super tender reddish pink interior. I would definitely come back here!